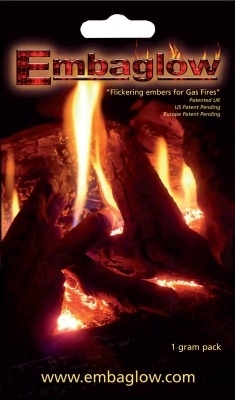 Embaglow 1g - Glowing Embers for Gas Fires. Embaglow - Glowing Embers for Gas Fires. 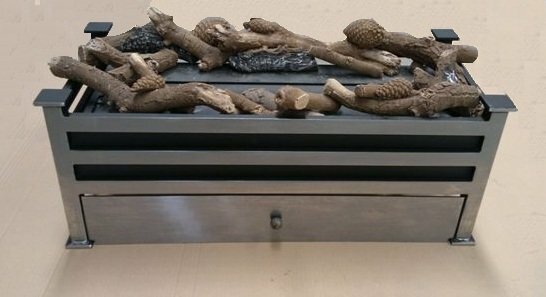 This product adds a stunning glow to gas fires on high and low settings. Embaglow is a metal fibre product designed to add a glow to gas fires. The fibre has a very thin diameter and responses instantly to the heat of the flame. As a consequence a shimmering glow is achieved as the gas flame moves over and then away from the fibrous ember. The effect Embaglow adds to a gas fire is quite dramatic. The glow produced by the fibres is greater than that seen on comparative products, and can be seen on both high and low flame settings. On landscape gas fires, most of the energy of the fire is converted into flame effect. As a consequence, the fuel effects (gas logs, gas pebbles etc) glow very little. Embaglow adds the glow back to these fires without impacting on combustion. Embaglow is simple to install has been tested to deliver at least 300- 400hrs of burning life. Over the last 4 years Embaglow has been used to great effect on open fronted gas fires, contemporary landscape gas fires, direct vent gas fires, balanced flue gas fires and conventional flue gas fires. In the videos shown below Embaglow can be seen working on various gas fire fuel beds. Although Embaglow has been tested and shown to be suitable for a wide range of fires, it is the user’s responsibility to ensure that Embaglow is authorised for use on the fire in question. Prima Industries Ltd are not responsible for the performance of their products and any loss of warranty caused by their use. We take no responsibility for any damage to the fire or persons caused by improper use and or installation of our products.